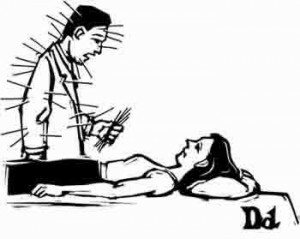 Patients who have received inoculations or other medical injections from a hypodermic needle are sometimes fearful that acupuncture treatments will be as painful. But such is not the case. Medical hypodermic needles are stiff, hollow, and thick for forcing liquid into the patient’s flesh, usually uncomfortable, if not painful, procedure. Typically, acupuncture needles are fine and flexible, no bigger around than a human hair or piece of thread. Deftly inserted into an acupoint by a skilled acupuncturist, the slender needle produces little or no sensation at all. When the needle makes contact with Chi, the energy, most patients experience a slight tingling sensation. First-time patients are usually amazed at how comfortable they are during treatment. Previous PostWeight LossNext PostWHAT IS ACUPUNCTURE?